How many times have you recommended a book with the caveat that it starts slow? My initial reaction to such a book is impatience (I often don’t bother to finish them) and then, secondarily (when I need to push on), a wish that its editor had been more resolute about insisting where the book really ought to begin. 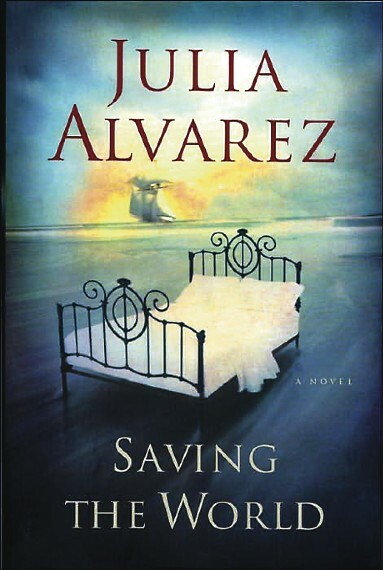 For its first 100 pages, Julia Alvarez’ new novel, Saving the World, is far too easy to put aside. Its narrator, bestselling Latina novelist Alma Huebner, whines about her depression, about the fact that she hasn’t written the book for which she’s received a $50,000 advance, and about her husband’s, agent’s and editor’s lack of understanding of these two things. She might have added the reader’s. Alvarez could no more leave this seed alone than a reader can resist a bookstore, and, as she researched the expedition, she discovered that a woman had accompanied the boys on their journeys. Alvarez had found her narrator: Isabel Sendales y Gómez. Isabel’s sections of the novel, which alternate with Alma’s, are told in a first-person narrative at once more engaging and accessible than the third-person present that hampers Alma’s. And yet, as the novel continues, something happens. No: A lot of somethings happen, and in the process, Alma’s narrative becomes as compelling, if not more so, than Isabel’s. I would be doing the reader a disservice if I revealed even one of the events that changes everything for Alma—and for the reader—but suffice to say that this is one of the few books in a long time whose last half I read in one sitting. So get through those first 100 pages. Take my word for it: The rest of Saving the World is worth it. Julia Alvarez presents Saving the World at the El Museo Cultural in Santa Fe on Wednesday, May 3, at 7 p.m. The event is sponsored by Collected Works Bookstore. For more information, call (505) 988-4226.